Whether you are a large corporate business or small to medium-sized business, Winterslow Village Hall can accommodate professional occasions to suit your needs. The Main Hall is spacious, giving room for 185 seated persons - ideal for presentations - or table provision if your guests have laptops or need to write notes. Our stage allows a speaker to see the entire audience and will project his talk perfectly with our quality public address system. We have wired and roving microphones ideal for static delivery or audience participation. The stage also provides an excellent position for a full screen if movies or slides are required. 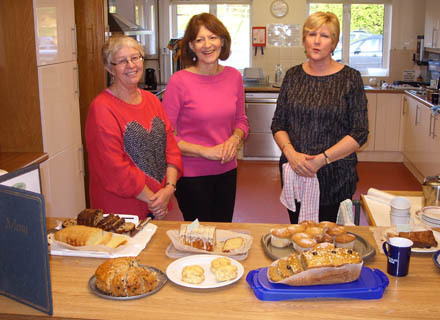 In addition, our kitchen and catering facilities are most convenient and tea, coffee and cakes can be made available from the serving area. Don't forget that Winterslow Village Hall has a very large car park which is fully illuminated at night for added security. No expensive town parking! Whatever the business, whatever the size, all businesses are welcome. The Main Hall accommodates large gatherings, while our tailor-made Meeting Room is perfect for the more intimate sessions and training courses. Winterslow Village Hall has the space, equipment and facilities to hold an exhibition or even a trade fair. The people of Winterslow, local traders in Salisbury and Wiltshire Council have used the Hall in the past and are frequent clients today.